Size: * 4 lb. 20 lb. 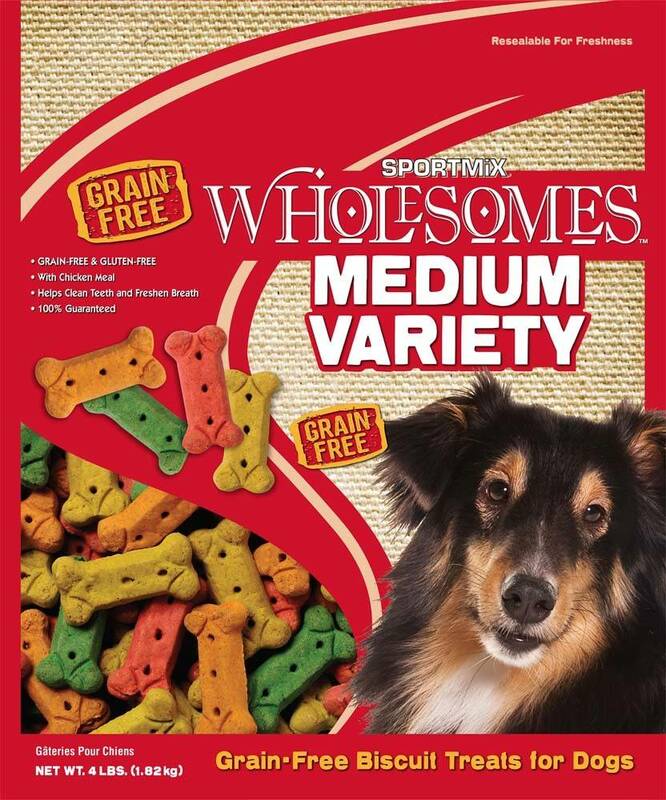 SPORTMiX® Wholesomes™ Variety Dog Biscuit Treats are a great reward for your dog or a perfect training aid. In four fun colors they are sure to please your dog. SPORTMiX® Wholesomes™ Variety Dog Biscuit Treats help your dog’s teeth remain clean and healthy. Particles in soft foods frequently stick to the teeth of dogs. This results in tartar build-up and bad breath. The hard, crunchy texture of SPORTMiX® Wholesomes™ Dog Biscuit Treats helps avoid this problem while satisfying the chewing needs of dogs. When used daily, these treats can help effectively remove loose food particles and tartar supporting healthy gums. 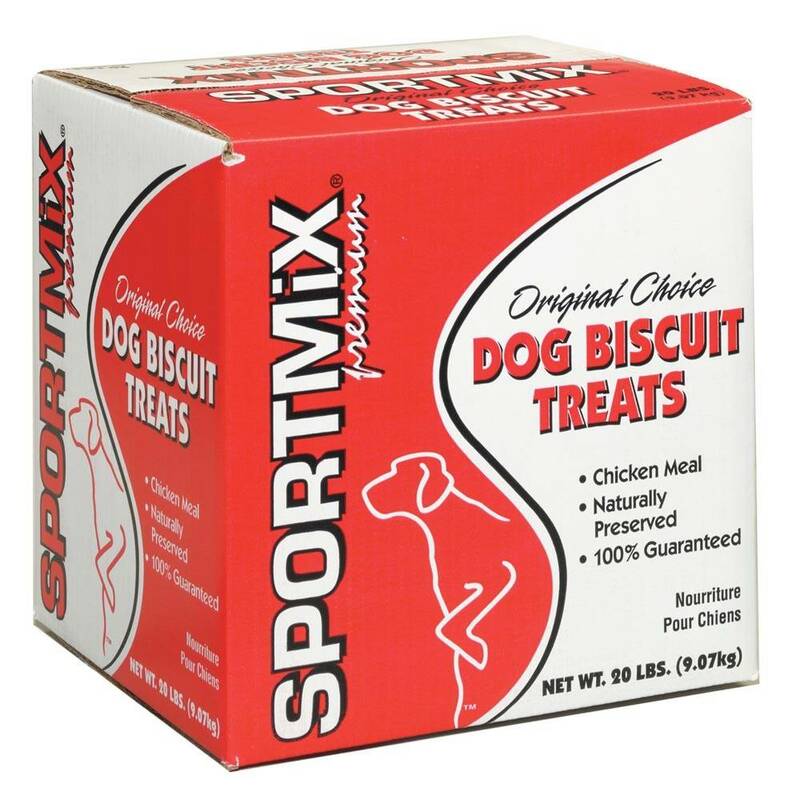 SPORTMiX® Wholesomes™ Biscuit Treats are naturally preserved and 100% guaranteed for taste and nutrition. These biscuits are available in medium and large-sized bones. Pea Flour, Chicken Meal, Pork Meal, Pea Protein, Natural Flavors, Chicken Fat (Preserved with Mixed Tocopherols), Added Color (FD&C Red 40, FD&C Yellow 5, FD&C Yellow 6, FD&C Blue 1), Vitamin A Supplement, Vitamin D3 Supplement, Vitamin E Supplement, Zinc Sulfate, Ferrous Sulfate, Niacin, Calcium Pantothenate, Riboflavin Supplement, Copper Sulfate, Pyridoxine Hydrochloride, Thiamine Mononitrate, Manganese Sulfate, Zinc Proteinate, Manganese Proteinate, Copper Proteinate, Calcium Iodate, Cobalt Carbonate, Folic Acid, Sodium Selenite, Biotin, Vitamin B12 Supplement, Mixed Tocopherols (preservative), Rosemary Extract, Green Tea Extract.